Following on immediately from the WSK Champions Cup, the first of four WSK Super Master Series races has been wrapped up on the Adria Karting Raceway after a weekend of tough weather. The entire Birel ART Racing team went out of their way to overcome the rain and the cold in order to get the most out of the event. Performances was not lacking in all three categories, especially for the new recruits, and the season is now well established. Davide Foré, the new Team Manager of Birel ART Racing, first of all wishes to thank the drivers and mechanics for their courage and perseverance in the face of the early February weather: "I salute all the efforts made this weekend by everyone so that the competition could run efficiently. It took a good deal of bravery to face temperatures often close to zero, a strong wind and incessant rain like we had on Saturday. I am very satisfied with the team's work and the results achieved during the qualification phase. The races were sometimes more complicated, but the result of our long stay in Adria is very informative for the start of the season and the development of our equipment. In the same way, our collaboration with TM Racing and our various preparers is looking very constructive." The WSK Super Master Series opening meeting got off to a flying start with Qualifying. A driver experienced in KZ, this time Marijn Kremers raced in OK to reinforce the work of the team. His pole position obtained against the best specialists boosted the ambitions of everyone in the Birel ART awning. With his 2nd place in KZ2, Riccardo Longhi was on the edge of a full season as an official driver. Luigi Coluccio confirmed the form of Lissone karts with the 8th fastest time. Lorenzo Ressico d'Aloisio and Thomas Dijkstra were 8th and 9th in Junior, despite the complex track conditions. The results, sometimes disturbed by the harshness of the races, were nevertheless rewarding with Kremers' 10th position in the championship standings. Luigi Coluccio was going well but was interrupted too early in the Prefinal. In the same way, Valentino Fritsch showed good competitiveness that unfortunately could not be expressed in the Final. As for Matej Kacovsky, he can be proud to have climbed back from 51st position up to 14th position in his Prefinal. The youngest showed good potential in OK-Junior. In the top 10 in Qualifying, Lorenzo Ressico d'Aloisio and Thomas Dijkstra made a promising run to the Final, while Francesco Pizzi lacked success in the Prefinal. "OK and the OK-Junior are the categories where we need to progress the most," said Davide Foré. "The newly homologated Birel ART chassis have very good potential which we have to match with the work from our engine tuner Macháč Motors. Moreover, this is where we meet the drivers who still developing. Kremers' presence in OK is very useful for us to move forward. It also gives confidence to our young people!" In KZ2, Alexander Dahlberg achieved the best performance of the weekend with his 6th place finish, while Riccardo Longhi was close to the top 10. Taken out in a spectacular incident at the start of the Prefinal, the DTM Mercedes driver Lucas Auer bravely started the Final. 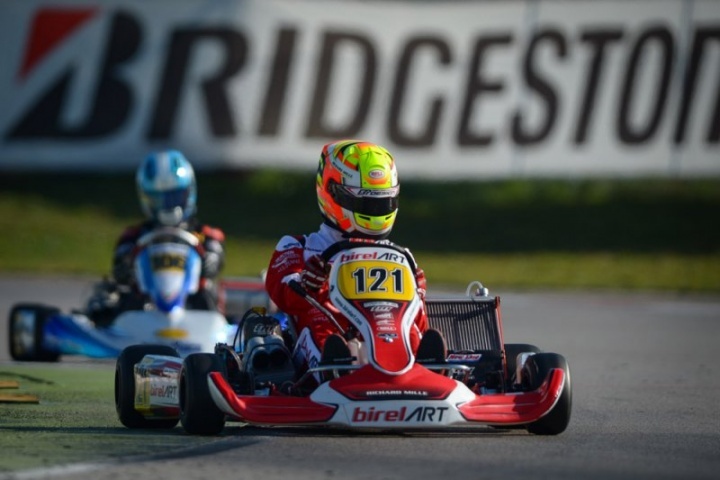 There will be little rest in the coming weeks for the Birel ART Racing team. Preparatory tests for the Winter Cup are already planned at Lonato before competing in this great opening classic of the international season. An meeting all the more important as the famous circuit of South Garda Karting will also be on the calendar of the WSK next month as well as the CIK-FIA calendar in May.